Over the holidays I had some time to catch up on my reading. 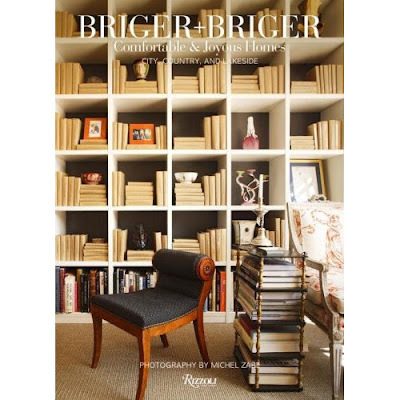 One book that I was anxious to read (especially because of the beautiful bookcase on the cover) was Briger + Briger. I love their approach to design which is very luxurious but very livable at the same time. I was particularly struck with their kitchen designs and the way that there are no over head cabinets. Instead dishes are displayed artfully. I also find it very user friendly, as you can see at a glance where everything is. Now I have a few caveats to add: #1 you need to have a uniform set of dishes to make this into an "artful" display #2 preferably the dishes should be white to make it look great. March 6 2008 Post Note: Paul Briger was good enough to comment on this post (click here to see his comment) He disagrees and adds: "the most important key to success in open stacking is the orderliness of the stacking, not the color(s) used. " 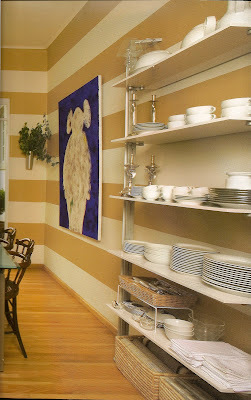 I like the uses of the bold, horizontal-stripes on the walls in the Breakfast Room. 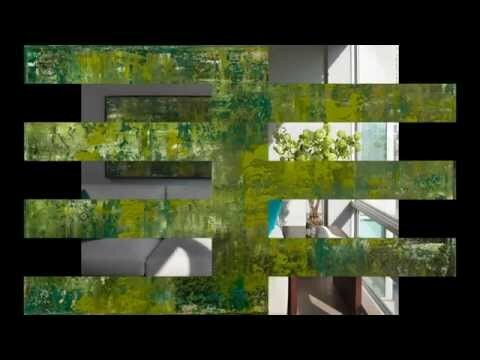 It adds width and interest to an otherwise narrow space. 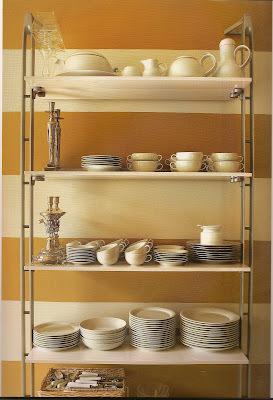 The dishes are set with an order that makes the utilitarian shelves especially attractive. The orderly placement of objects no matter how grand or insignificant can produce an aesthetically pleasing display. The picture above and below is a pantry that leads to service stairs. which in turn ascend to the pool level. 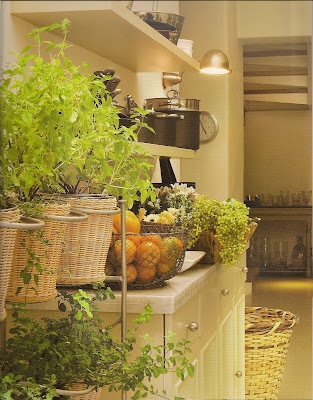 A plant stand holds a variety of potted fresh herbs for the kitchen. A view of the kitchen that goes with the above 2 photos showing the door to the Pool level. 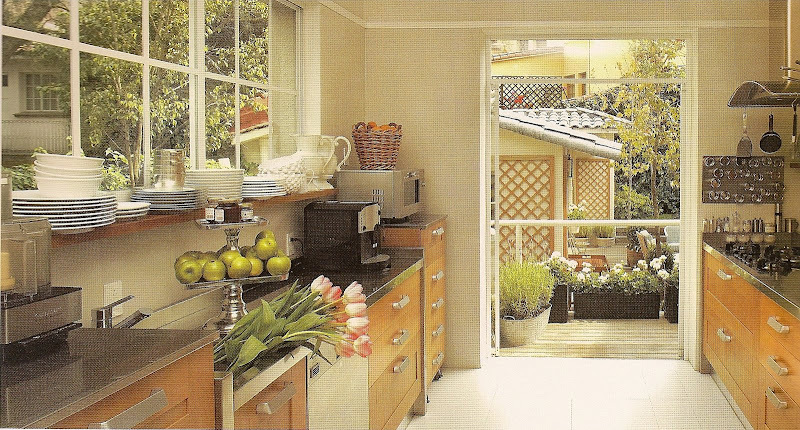 This kitchen is compact, functional, and pleasing to the eye. It suggests that in this house much attention is paid to the preparation of meals. 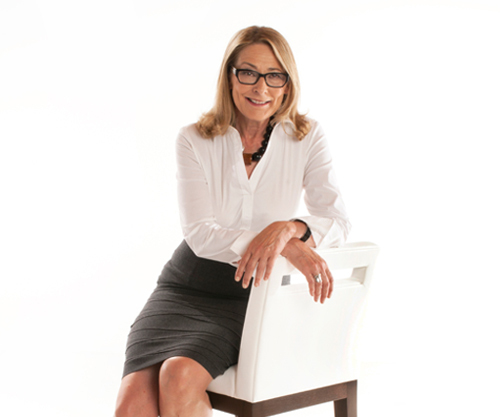 Patricia, What a lovely, simple, clean look! 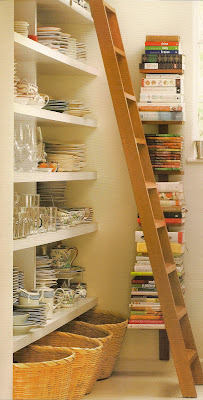 I LOVE the cookbook shelves!! I wish I could DO that all white dishes thing - I am just too drawn to color! What a great post - very inspiring!! thank you. I know what you mean about being drawn to colour. I work with color all day so to me white is a visual rest. Thanks for your comment. I plan to do more posts on the work of Briger + Briger. Stay tuned! P.S. I went straight to Amazon to order the Briger + Briger book! It looks very interesting and fresh. I'm sure you will love it. Let me know. I think that kitchen shelves also looks great when all dishes in one colour. And not depend which one. Looks similar like books on the bookshelf, when them in one color it looks like relax for mind. I agree with you about one color relaxing the mind. Thanks for dropping by and commenting. I went to your Blog and alas I am sorry that I don't speak your language as well as you speak mine. these shelves would keep me honest. I collect all white china! Yes I agree - you'd either have to have all the same plates or none the same for the plates on shelves to work :-)!! I love the look, it gives the kitchen a "professional cook" look ;-) I collect white Pillyvuit porcelaine and I'd love to display it in my kitchen. Thanks for sharing these ideas! 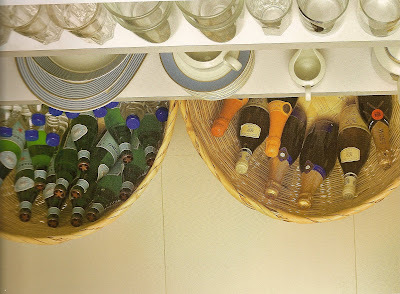 I love the walk-in pantry and the baskets filled with bottles. I like that you collect white dishes. And you are too funny when you say that open cupboards would "keep you honest". How poetic. All the same or nothing the same is a good way to put it. I love Pillivuyt French Dinnerware. I agree about the kitchen looking professional as well as looking like someone actually cooks in it. I should do a post on the different brands of white dishes. 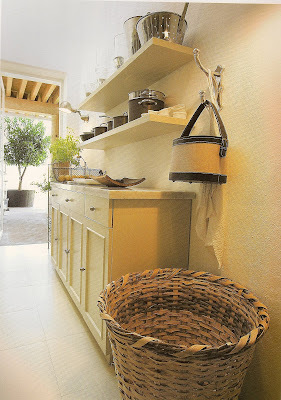 Walk-in pantries are such a luxury these days when we are living in smaller spaces. Usually pantries are used for storing food stuff, but I like the concept of being able to see all my dishes at a glance. i love the stripes that follow the lines of the shelves! great post! We enjoy your blogsite and very much apreciated he mention of our book, Briger + Briger. We thought that you might like to see some photos of the room we installed at Bergdorf Goodman's 7th floor on Feburary 20th. It will run about 2 months. A press release is also attached for details. P.S. I was interested to note that the comments regarding open shelving seemed to take the view that it is necessary to use white dishes only in order to use that system effectively. We disagree; the most important key to success in open stacking is the orderliness of the stacking, not the color(s) used. Hi Patricia, your website is very inspiring. Where is the best place to shop for kitchen shelves? Thank you.